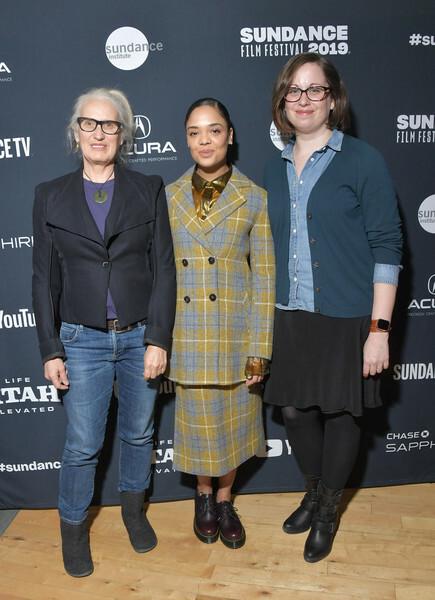 (L-R) Jane Campion, Tessa Thompson and Alissa Wilkinson, speak onstage at the Cinema Cafe 8 during 2019 Sundance Film Festival at Filmmaker Lodge on February 01, 2019 in Park City, Utah. Tessa Thompson kept it modest in a plaid skirt suit at the 2019 Sundance Film Festival Cinema Cafe 8. Tessa Thompson styled her look with a pair of leather lace-ups.